Thursday, April 10, 2014 at 6:00 p.m.
Nicholas Kasirer is a graduate of University College (B.A. (hons)) at the University of Toronto, McGill University (Bachelor of Civil Law and Bachelor of Laws) and the Université de Paris I (Panthéon-Sorbonne) (D.E.A. 3e cycle). A member of the Bar of Québec since 1987, he was appointed to the Court of Appeal on July 29, 2009. Nicholas Kasirer began his career as a law clerk to Justice Jean Beetz of the Supreme Court of Canada. In 1989, he joined the Faculty of Law at McGill University and was appointed the James McGill Professor of Law in 2002. 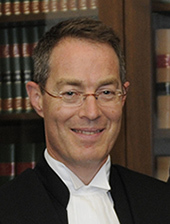 In 2003, Nicholas Kasirer was appointed Dean of the Faculty of Law at McGill and served in that position until his appointment to the bench 2009. Over the course of his career, he was awarded several prizes including the Prix de la Fondation du Barreau, the Hessel Yntema Prize of the American Society of Comparative Law, the David Johnston Medal from McGill University and the John W. Durnford Teaching Prize from its Faculty of Law. He was elected a Titular Member of the International Academy of Comparative Law in 2006 and received an honorary doctorate from the University of Sherbrooke in 2012. Justice Kasirer is a Fellow of the Royal Society of Canada. The Civil Law in English has a distinctive sound, setting it apart lexically and conceptually from the vocabulary of the Common Law. In jurisdictions connected to the French civilian tradition such as Québec, this distinctiveness is in part the result of the imprint of French legal ideas and of the French language on legal parlance. The language of the law is also distinctive in other mixed jurisdictions – there appears to be a “New Orleans Sound” and an emerging “Eurobeat” for the Civil Law in English – where the influence of French as a matter of historical and social fact is felt differently. Drawing on insights taken from scholarship in comparative law, legal bilingualism and translation studies, the speaker seeks to evaluate the variable character of the phenomenon on the Civil Law in English within the French legal tradition.